Official description Want a new trophy? Here's your shot at Majora's Mask. Trophy Tussle 3 (フィギュア上の戦い３, Battle on Figure 3) is the 47th event match of the 51 event matches in Super Smash Bros. Melee. In this Event Match, the player chooses a character. The player will have two stocks and three random enemies also have two stocks each. The match is a three minute free-for-all, meaning foes can attack each other, though in practice they usually follow the player. 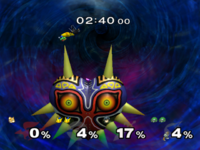 The stage is Majora's Mask, which the player gets a trophy of after clearing the stage. This page was last edited on July 21, 2018, at 18:21.